Does your calendar currently work for you? 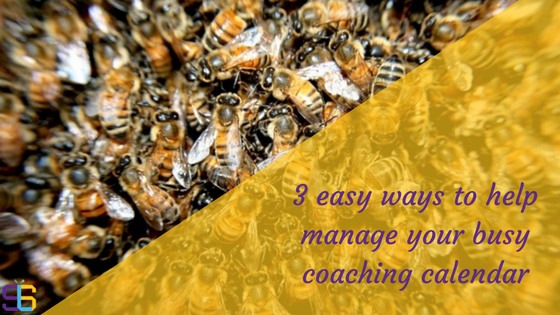 One of the top grievances I hear from my coaching clients is to do with managing their calendar or diary. Things like “I can’t see what time I have available”, or “All the appointments seem to just flow into one big block & I can’t differentiate between them”. Whether you use a paper-based diary / calendar or one of the many digital ones available online, setting up an easy to view system (in a way that works for you) will save you heaps of time. Below are 3 ways I use my calendar which I’ve been doing for years. I use Google calendar alongside a paper-based diary (these tips also work on Outlook). Remember there is no right or wrong way to do this – it’s whatever works for you. 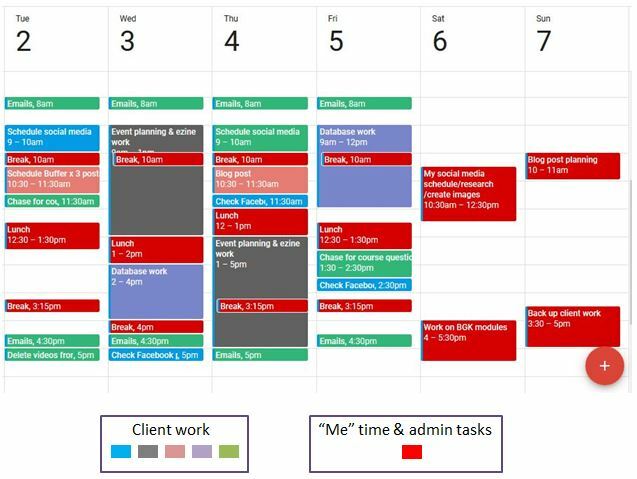 Colour coding your calendar is one easy way of quickly seeing exactly what you have scheduled in and how much time you have available. I’ve been colour coding my tasks for years – to begin with I used to colour each type of task I was doing, for example all social media tasks were in red, all spreadsheet work was in green, all event planning work was in blue, and so on. This worked for a while however I wasn’t completely happy with it; it just didn’t “feel” right for me so I changed it and now each of my clients has their own colour. So, how could this work for you? You will be surprised at how much easier it is to see what you have on each day, and what time slots are actually free as all the white space is available time. We all know the importance of taking regular breaks, making sure we have a good lunch break, getting fresh air and so on; and yet as soon as we become self-employed we immediately schedule our days to be full and ‘busy’, and spend the nights complaining about how exhausted we are! Make sure you schedule time in for YOU! It could be 20 minutes to grab a cup of tea, it could be a 2 hour lunch for you to meet friends, or it could just be 10 minutes to go outside for a breather… it doesn’t matter as long as you schedule it in. Treat the blocks of “you-time” as you would client work; don’t keep moving the time slot back (you wouldn’t do that with client work! ), be disciplined and TAKE A BREAK! I schedule in an hour every day for lunch and I always have it… on some days I may have to move it 15 minutes earlier or later if I need to finish work but I still make sure I take it. I also schedule in 20-30 minutes mid-morning and mid-afternoon. It took me about 3 years of self-employment before I stopped feeling guilty about taking breaks – I now know that it’s the best thing I can do on busy days as it re-energises me & increases my productivity! While it’s great to have a full colour blocked calendar of paying clients, you also need to schedule in blocks of time for your office admin (unless you outsource it of course 😉 ). Being busy with clients is all well & good until you remember you haven’t invoiced them for the last few sessions and cash flow becomes an issue! Schedule in regular blocks of time each week to do your invoicing, social media, updating contact lists etc. You can easily set up these tasks as “recurring” in both Outlook & Google calendar to be repeated on a weekly basis. If you don’t schedule them in they will end up being put on the long finger and what was initially a small 20 minute task will turn into a mountain of paperwork… nightmare! Bonus tip: Try to leave at least 10 minutes between each task to step away from your desk and take a breather. This will also allow you to refocus on a new/different task when you return. And make sure you give yourself plenty of time between client appointments – especially if you’re traveling in between. I hope the above tips help you manage your calendar better. Remember nobody else is in charge of your schedule except you – all work booked in is because you’ve booked it in! As I said before there is no right or wrong way of doing it… as long as it works for you!